Avocado sandwich is as simple as to make under 15 minutes. You no need any pre-preparation and just need to toss up all the ingredient. Club between the bread slices and toast it. Sandwich is ready to relish with glass of fresh juice. Bachelors, home-alone guys can give a try to this exotic sandwich. What need more for a healthy weekday breakfast. 1. Bright Green - Fresh shiny,firm not yet ripe avocado. 2. Dark Green - little hard, semi ripe . 3. Purplish black or green - soft when hold in the palm, fully ripen, ready to use. Avocado is a tropical fruit with some unique taste and texture. You should know the purpose of use, before you purchase. But still you can buy the firm one and ripe at home. Avocado may tends to discoloration, always use or cut as needed or wrap in cling-film to avoid discoloration. For Paneer Tikka : In a Large mixing bowl mix all ingredients hung curd, Chilli powder, Coriander powder, Garam masala, Ginger garlic paste, salt, kasuri methi, Amchur (Dry mango) powder and prepare marination paste. Mix well and add fresh paneer cubes, onions and cubed capsicum. Mix well to coat them well with paste. Keep it in refrigerator for half n hour for marination. Spread all cubes in a aluminium foil and brush with butter or oil. Broil in a preheated oven for 15 mins or until they start to get brown spots on edges. Alternatively you can also grill them in skewers or shallow fry them in pan. For Rotis : In a mixing bowl, combine all ingredients mentioned for roti except butter. Mix well and prepare a smooth dough. Keep it aside and give it rest for 10 minutes. Divide dough into 6 balls, take one ball, dust it in dry flour and roll out into a thick roti (thickness of 1 $ coin). Cook it on hot griddle and grease with butter. Cook both sides evenly until brown spots appear. Repeat the process and prepare all rotis. Proceed to make Rolls : Place one roti on a working surface and spread one 1 tsp of green chutney. Sprinkle salad leaves/lettuce and onions. Finally in the middle of roti place prepared paneer tikka on it. Very carefully wrap up the roti and make a tight roll. Use toothpick to close the edges. or wrap them in aluminium foil. Paneer tikka kathi roll is ready to serve. After the great try of spicy roasted makhana/lotus seeds was planning to make some delicious rich gravy with it. The recipe calls for paneer and makhana. The combination was really unbeatable and went well with hot phulka. I even suggest you to try with khoya in place of paneer and it taste equally delicious. To thicken the gravy or to cook for a crowd add crumbled paneer / chenna. Chocolate Orange Yogurt Mousse as its name says, it is a delicious sweet dessert with a hint of tangy orange and yogurt gives a unique richness and makes it healthier version of regular creamy mousse. It is really easy to make extremely relishing dessert. Try out this nutritional version of recipe to make Choco-Orange Yogurt Mousse. Whole wheat flour and a liberal amount of sweetcorn, makes this paratha a nutritious dish, which is crispy yet soft. Aromatic herbs like coriander along with caraway seeds gives these paratha naturally stronf flavor that kindles one's appetite. The perfect to go lunch box recipe, pleasing to relish simply with plain curd and pickle. Baking a bread vegan style in quite interesting and very affordable to bake at home. This recipe is easy and fool proof. A great bread recipe to try for bakers at beginning level. The healthy banana walnut bread enriched with positive benefits is perfect for breakfast to kick start your day more energetic. The best way to use up the over ripen banana. The bread tastes better and more delicious the day after it is baked. Mash the peeled banana with a fork. Mix well with sugar and oil. Sieve the all purpose flour, baking powder and combine with the banana. Finally add the chopped walnuts and combine. Preheat the oven at 200°C. Line in the 2 lb loaf pan with non stick baking sheet and pour in the bread batter. Tap on counter top to spread evenly. Top it up with some walnuts(optional). Bake the bread for 60 minutes. After 25-30 minutes of baking process check the bread and cover with foil if it starts over browning. Allow to cool in a wire rack completely before slicing. It stays good for 3-4 days. Cover the bread with foil after 25 minutes, if it starts turn darken brown. For variations add raisins and more nuts as per your choice. You can even substitute APF with self-raising flour and reduce baking soda to 2 tsp. Making a healthy breakfast yet delicious is a great treat for tastbuds. Including oats in your diet is added advantage for healthy eating. This instant version of oats dosa makes you fall crave for it every time you make. For people who got boredom of eating regular oats porridge can alternate your menu to the tastiest oats dosa. The more crispiest and more tasty with or without the addition of yogurt. Dosa tastes perfect with mint chutney or even with some spicy chutney. Mix all the dry ingredients and store in a air-tight container, mix water and other wet ingredients just before you need to prepare dosa. This greatly helps in time management ans useful tip for working people. Chop Onions and green chillies finely. Combine the flour, rava, oats in a microwave bowl and roast in powder high for 1 minute or roast in a fry pan. To the roasted dosa mix. Add chopped onions, green chillies, cumin seeds, curry leaves, cashews, needed salt and mix well. Add yogurtand required water until the batter is thin like rava dosa batter. Set it aside for 10 minutes. Apply oil over the surface of dosa. Let it cook on medium flame, as it takes little longer time to cook unlike plain dosa. Flip the other side and cook for further a minute or more. Serve hot with mint chutney or chutney of your choice. Always mix the batter before makins dosa to prevent the flour settling to the bottom of vessel. Pour water as needed after making two or three, as the batter might become thicker. This process helps to make a thin and cripy dosa as ever. Yogurt can be replaced with buttermilk and added to the batter. Roasting the dosa mix yields golden brown dosa. Store the dosa mix (dry ingredients) in an air-tight container and use as needed. Stays good for months. You can also roast and grind oats to fine powder for making dosa. Smoothies are the one which are easy and super quick to make, extremely nutritional and extra delicious; and above all it can be made in so many variation with your favourite fruits. Here I have made Apple Banana Smoothie. It is very thick, smooth, creamy and filling too. It can be served in breakfast or in between meals. Try out this easy recipe to make Apple Banana Smoothie!! Clean apple and chop it roughly with skin on. Peel off banana and chop it. Add banana, apple, flaxseed, and milk in a blender. Blend it well. Add more milk if you like thin consistency. Yeah, it's super quick...Apple banana smoothie is ready to serve. I garnished it with chocolate slivers!!! For variation use any other fruit along with banana. Also add a tbsp of choco powder for added flavor. Aval Idli is a super soft and spongy which melts in mouth when dunk in sambar and chutney. Aval is popular as poha /flatten rice flakes. These piping hot idlies can be relished simply with any spicy kara chutney or Millagai Podi too. 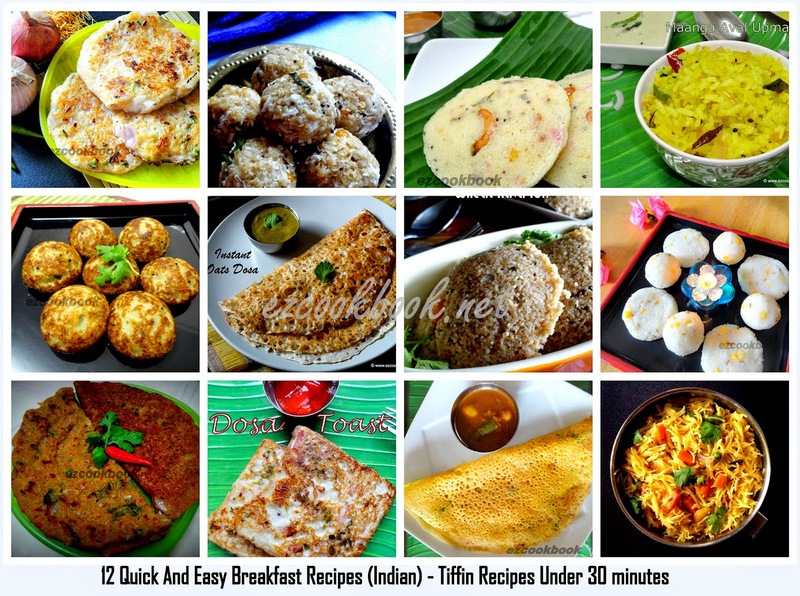 As I said in my earlier posts - Idlies are always a staple south Indian breakfast recipe. The tradition begans from sangakaalam. Adding poha while grinding the idli batter gives a velvety soft texture and also improves the whiteness, that make idlies really irresistible. See my Idli picture, doesn't it looks enticing. I swear you cannot go wrong if you add poha as a secret ingredient to make soft Idli. This is simple, very basic butter biscuits. The basic biscuit dough can be combination with chocochip or nuts or dry fruits or oats to make delicious cookies. The dough will happily sit in the fridge for up to a week, so make as and when needed before party. These are light, crisp and delicate biscuits. Each bit of buttery biscuits when dunk in tea will literally melts in mouth. Easy to roll and perfect to shape biscuits as you desired. Kesar Pista Kulfi is a easy and Indian version of Saffron Pistachio Ice Cream. It is a very popular dessert amongst Indians and around the world. It has many variations i.e. Malai Kulfi, Mango Kulfi or Almond Kulfi. Authentically It usually freeze and served in earthen pot or "Matki" . My family members are huge fan of Kulfi (Qualfi) so I made it in large quantity and set it in variety of molds. I used matki for my hubby, popsicle moulds for my son and use n throw plastic cup for me and you(to take a pic for blog and show it to viewers :D ) Check out the below recipe to make Kesar Pista Kulfi!!! Crepes have always been a hit and popular around the world. Here I gave it a simple yet sweet and delicious twist by making it with a combination of Chocolate and Banana!!! Serve it as a dessert or make it in morning for breakfast to kick start your day!!! Here comes the easy and quick recipe to make Eggless Chocolate Banana Crepe!!! Paneer Tikka Masala; a famous and all time favourite dish of almost everyone in India. It is made with marinated tangy and spicy paneer and vegetables kebabs. Later dipped in a very simple yet delicious gravy/masala. Serve it as a appetizer when dry or dip them in a gravy and serve in main course with Roti/Naan/Rice. Check out the EzRecipe and learn how to make Paneer Tikka Masala. Rice dhal Patties is originally known as Kandi Nooka Billa Kudumulu / Thavilla Billa. This is very famous authentic breakfast recipe among telugu people of southern part of India. Rice Dhal Patties are made using combination of rice and dhal of equal proportion 2:1 ratio.This receipe comprises good source of protein,carbohydrate and delicious one too.Try this different variety of breakfast and send us your comment. Combine rice and dhal in a bowl,using food processor/mixie grind it to course powder, this will about 11/2 cups. In a heavy bottom pan boil 3 cups of water,add tsp of oil,pepper crush and salt. Simmer the fire slowly pour in the rice dhal powder,don't stir let it cook for 5 minutes. Now using ladle mix the powder well with water without lumps and cook again for 5 minutes. Cool the mixture and pinch into medium lemon size balls, flatten between palm(if the mixture becomes too hard use water to loosen, as this will help to make patties even size). Heat the griddle and grease oil. Place the prepared patties and apply oil over the surface(can place around 5-7 patties at a time on the griddle depends on the size you prepare). Cook covered on slow medium flame for about 5 minutes,to change slight golden brown. Flip it over another side and do apply oil again,uncover and cook for 5 minutes till golden brown. Serve this Yummy delicious Rice Dhal patties with Onion Chutney. Try to cook on slow medium flame, this will give crispy layer to the patties which tastes good. You can even try with channa dal instead of thoor dhal for a varaition or both dhal in equal proportions too. For variation can also do deep fry, but if you are health conscious avoid it. Happy Diwali to All Ezcookbook Viewers and Friends!! Bombay Karachi halwa also popular as Rubbery halwa. It is made of corn flour with desi ghee and some nuts. This transparent halwa tastes much different from rest of the halwa recipes. It has very less ingredient and gives a glossy texture. Make this delicious sweet with more patience as it need constant stirring, but end result will be absolutely divine. Take corn flour in a mixing bowl. Dissolve the corn flour with little water to thin liquid without lumps. Pour in 1 cup of water to it and mix well. Add lemon juice and keep aside. In a pan combine sugar and 1/2 cup of water. Cook until sugar melts and syrup gets ready. There is no need to check for any consistency. Now stir the corn flour water once and add to the boiling syrup. Reduce the flame to low and keep stirring continuously. Slowly it starts to thicken. This will take around 12 - 15 minutes. Steadily halwa will start appearing transparent. Add half of the ghee to the mixture now and stir again for 5-6 minutes. Add the food color and some more ghee at regular intervals. Stir continuously and let the ghee incorporate well. Add the nuts, cardamom powder, rose essence and mix well. Halwa should become transparent and cook for further 8-10 minutes with the laddle to make it thick shiny consistency. Pour on the greased tray and let it cool completely. After three hours cut the halwa into cubes and serve. Store the halwa in a container and it will stay good for many days, no need to freeze. Stir the halwa continuously to avoid forming lumps in between. Avoid cooking in the high flame. When the halwa cooked nicely yield rubbery texture, means it will not break when you press between fingers. If halwa breaks when you cut into pieces then its not cooked properly, you can cook again with more ghee added to it to get perfect. In order to speed up the cooking process you can cook in the microwave oven. It will taste equally good. Adding lemon juice helps to avoid sugar syrup getting crystallized.